In the afternoon of 25nd May, 2018, Ph.D.Candidate Xiao-Jun Wang defended his doctoral dissertation in Room A205,Zhugongshan Building, NJU. The thesis defense committee members were Prof.Xi-Sheng Xu, Xiao-Lei Wang, Wei-Qiang Li from NJU, Prof. Qun-Ke Xia from ZJU and Prof. Shao-Bing Zhang from University of Science and Technology of China with Prof. Xu as the chairman and A. P. Gang Zeng as thesecretary. 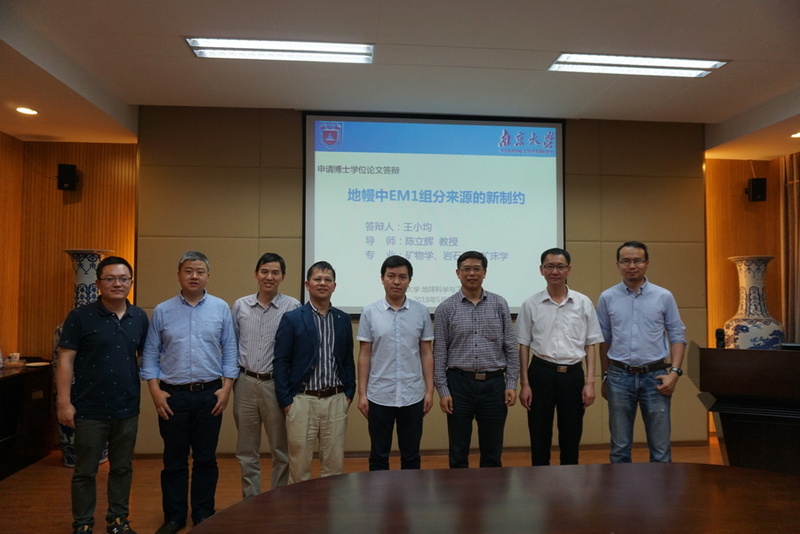 Wang’s Ph.D. supervisor, Prof. Li-Hui Chen attended this defense together with all members of Rockingmantle Group. Based on his doctoral thesis"New perspective pn the origin of EM1 component in the mantle", Wang answered the questions raised by the committee quite well. After the discussion among the thesis defense committee, the doctorate was unanimously conferred on Wang.